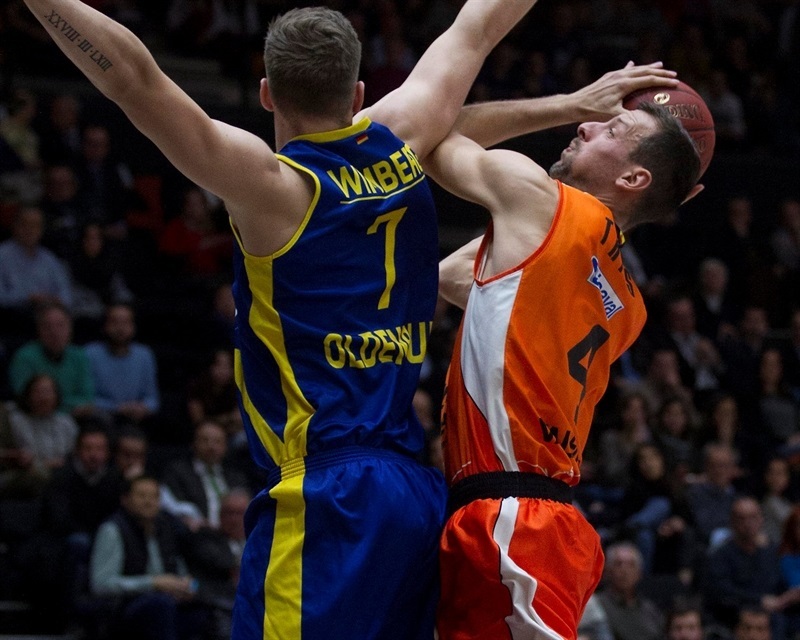 Three-time champion Valencia Basket finished its Eurocup season in style by downing EWE Baskets Oldenburg 77-62 at home in Group I on Wednesday. 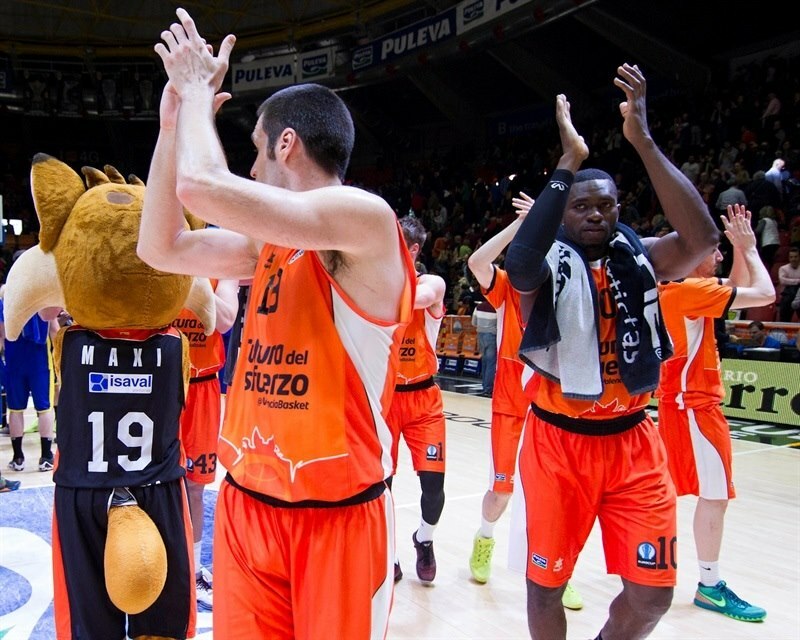 Valencia needed a win and PAOK Thessaloniki to beat Limoges CSP, which didn't happen. Both Valencia and Limoges had a 3-3 record at the end of the Last 32 but Limoges beat Valencia twice, giving it the tie-break advantage. 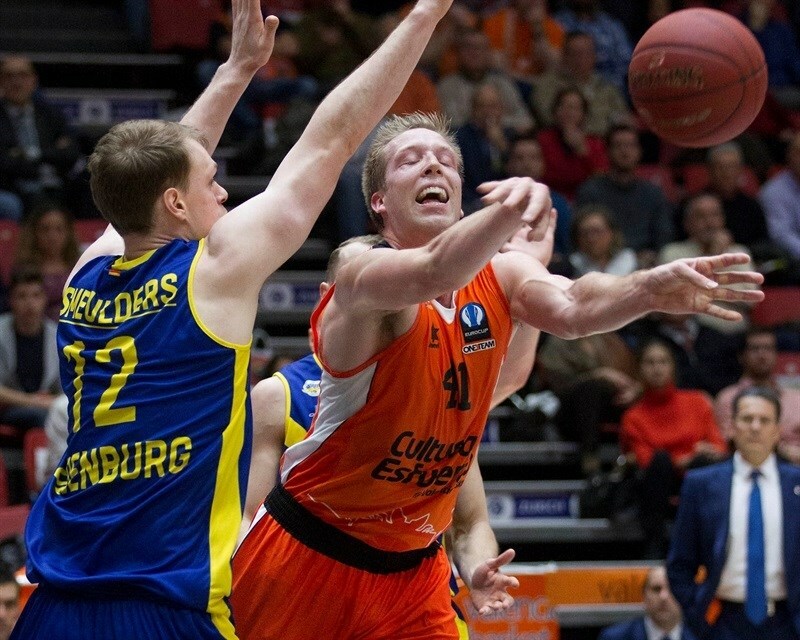 Oldenburg was first in Group I with a 4-2 record and will face Strasbourg in the Eurocup eighthfinals. Justin Hamilton led the winners with 16 points. 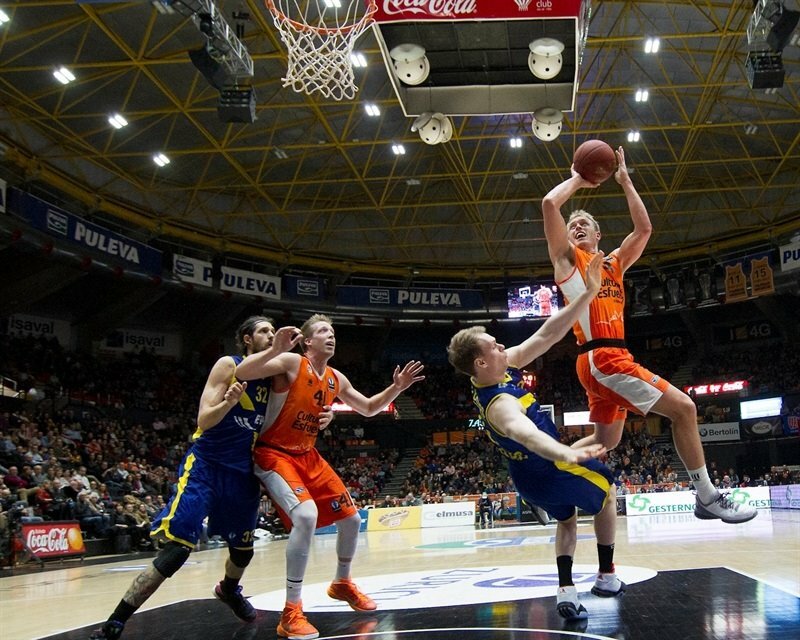 John Shurna added 13 while Antoine Diot, Guillem Vives and Rafa Martinez each had 10 for Valencia. Rickey Paulding led Oldenburg with 20 points. Brian Qvale added 10 for the guests. Valencia led 23-20 after 10 minutes, extending its margin to 40-35 at halftime and then again to 66-49 at the end of the third quarter, enough for the hosts to control the game until the final buzzer. Diot got Valencia going with consecutive baskets and a put-back layup by Luke Sikma made Oldenburg call timeout at 6-2. Qvale hit a jump hook and Paulding scored off a steal to tie the game, 6-6. Hamilton struck from downtown and a steal by Diot allowed Martinez to give Valencia an 11-6 lead. Vaughn Duggins found his first points and Hamilton accidentally scored in his team's own basket but a triple by Martinez kept the hosts ahead, 14-10. Nemanja Aleksandrov answered from downtown and Chris Kramer tied it at 15-15, but Vives and Shurna allowed Valencia to regain the lead, 21-18. Another basket by Duggins and free throws by Bojan Dubljevic fixed the score at 23-20 after 10 minutes. Qvale scored again early in the second quarter but Shurna nailed a triple for a 26-22 Valencia lead. Dominic Lockhart and Paulding tried to change things for Oldenburg, tying it again at 28-28. Dubljevic scored in the low post and Vives fed Shurna for an alleyoop slam that ignited the crowd at 32-28. Qvale and Paulding kept pacing Oldenburg and a free throw by Kramer tied it again, 33-33. Diot stepped up with a layup, Vladimir Lucic hit a jump hook and Hamilton did even better with a triple for a 40-35 Valencia edge at halftime. Martinez buried a jumper soon after the break but Aleksandrov answered from downtown for a 42-38 Oldenburg deficit. Hamilton scored again and Martinez erased Paulding's three-pointer with his own shot from beyond the arc. Valencia kept running its offense through Hamilton, who followed a layup with a triple to make it a double-digit game, 52-42. Paulding hit another three-pointer but Diot and an unstoppable Hamilton kept Valencia out of trouble, 56-47. Duggins made free throws but a three-pointer by Romain Sato sparked a 10-0 run in which Dubljevic had 5 points to boost the hosts' margin to 66-49 after 30 minutes. Qvale scored again early in the fourth quarter and a three-pointer by Kramer gave Oldenburg hope at 66-54. Shurna followed an alleyoop slam with free throws to boost Valencia's margin to 70-54. Scott Machado buried a three-pointer but Vives answered from downtown to seal the outcome, 73-57, with 6 minutes left. 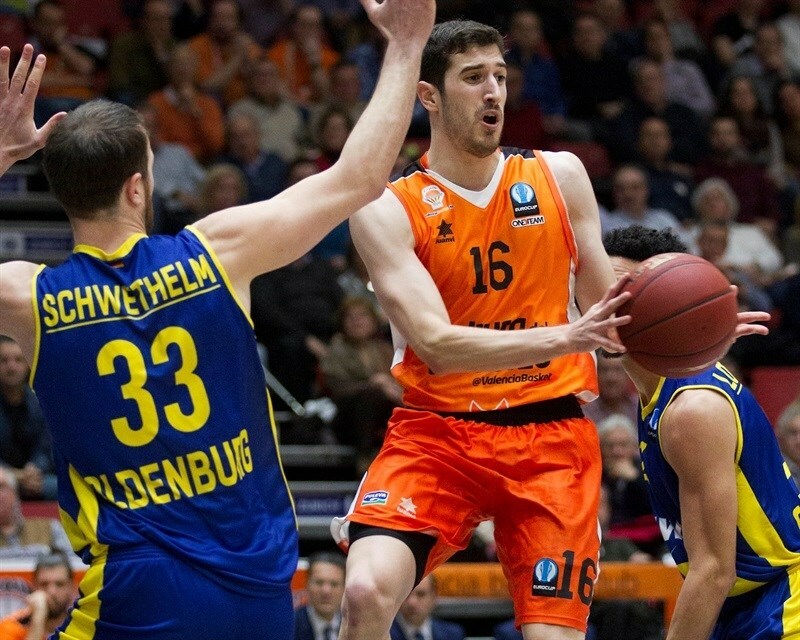 Oldenburg kept trying but Valencia had cruised to its final Eurocup win this season. "We played well, had good moment on offense and defense but obviously, it was not enough for us to quality. From a technical point of view, it was a positive game for us and in that sense, we are happy. 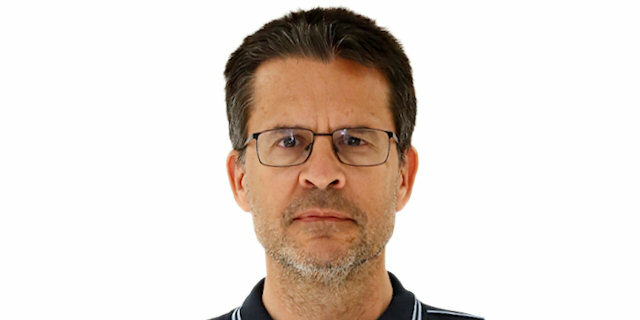 From a global standpoint, we are not happy that have to assume that we are eliminated, which we didn't like it to happen. We must move on and focus on our next goals. We didn't expect to be eliminated in this stage. We have to get ready for our next game and don't think ahead. I don't want to offer any excuse, we have to accept what happened. 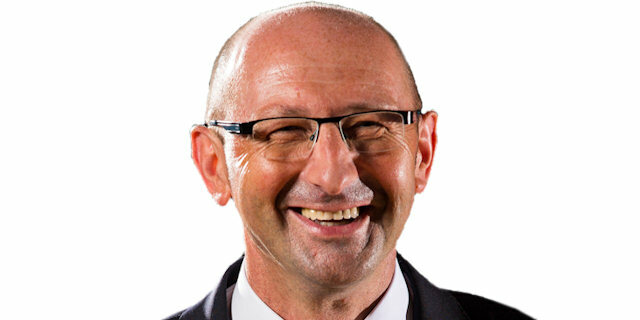 You pay a price for every home loss and were not able to bounce back on the road, against Limoges and PAOK. In a four-team group, you pay a high price for your mistakes. We have to step up, no excuses, be brave and get ready for our next challenge." 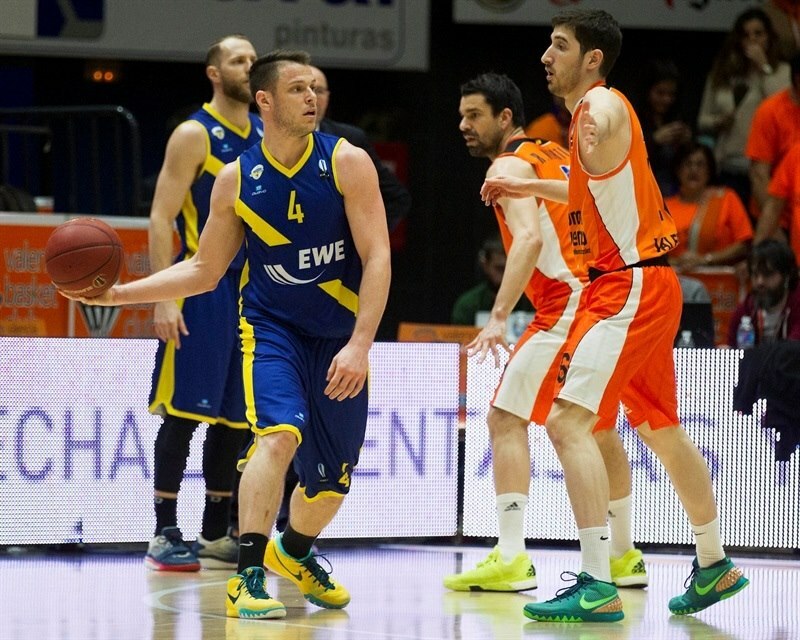 "We knew that Valencia is a very hard court to play at. We came out with the goal of playing better defense than in the first game. We did it for 30 minutes, but in the end we gave up too many offensive rebounds. "